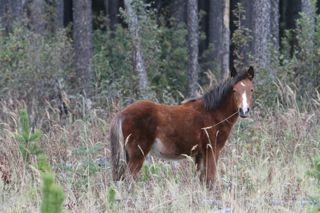 This fall has been wonderful here in Alberta’s wild horse country. Except for one small blast of snow, which melted quickly, the weather had been superb. This allowed the horses to put on some body reserves for what some are calling a hard winter to come. Then this weekend the snows came again with a vengeance with accumulations reaching 25-30 cm. The horses and the other wildlife will have to worker harder for their feed now. The foals from this year that have survived are strong and in very good shape to winter with their herds. The only trouble looming on the horizon is a capture season for upcoming 2013-2014 season. A steering committee to come up with management strategies for our wild horses was formed by the ESRD, using an independent consulting company “Strategic Relations Inc.”. This committee has several of the stakeholders, including ranchers, lumber companies, Livestock Inspection Services, RCMP livestock investigation, horse capture permit holders and others deemed to have a stake in the effect that the wild horses have on the ecology of their rangeland. At the last meeting on October 4, 2013 in Red Deer, the general consensus was that a capture season should be held. WHOAS, represented by myself, was the only stakeholder opposed to this capture season. Our reasoning was that the number of yearlings with the herds that were counted in the census count held in March 2013, was very low. Then you take the very low number of foals with herds this year, it appears that this is affecting the population growth of the herds. Therefore let’s wait and see if these factors did have this impact on numbers in a count next March. The decision on having a capture season for this year has not been made as of yet. The matter is before the Minister Diane McQueen for her consideration. It all comes down to financial interests with those opposed against the wild horses stating that the horses affect their bottom line. and therefore there should be a capture season. The ESRD Rangeland Management have deemed that of all the available grazing available on public forestry land, 50% is for wildlife and 50% is for the cattle leases, leaving nothing for the horses. 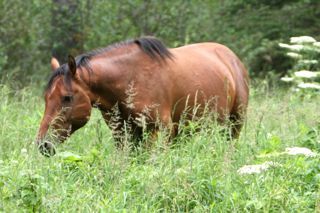 With the horses being present all year the lease holder group state that the horses are degrading the grasses before their cattle are allowed on to graze. Lumbering companies are still insisting that the wild horses nip off the top of the new seedlings, thereby setting back the regeneration of the clear cuts. They also insist that the horses have attacked their workers. The hunting groups state that the wild horses are an invasive species and are the reason that huntable wildlife numbers are dwindling. ESRD have most convinced that the numbers of wild horses are “mushrooming out of control” and that they are a threat to the ecosystem. We in WHOAS believe that most of these arguments are really unsubstantiated by good scientific research. We would argue with most of the points brought forward against the wild horses and could point out the damage being done by some of these self interest groups and others that use our public lands. A good wild horse management strategy is needed to protect the wild horses, their rangeland and other wildlife. Wholesale large scale capture of the wild horses, with most going to slaughter is not a good strategy for most of us that appreciate the biodiversity of our Alberta. One only has to look at the difficulty other organizations are running into when dealing with the protection of the ecosystems, wildlife habitat, watersheds and threatened wild animals themselves, (caribou, grizzly bears, etc.) , to realize where the interest seems to lay with our current government policies. 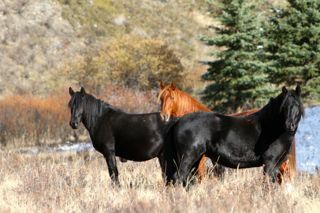 So our efforts to seek better protection for the wild horses and the environment they exist in is far from over. We continue to need public support in these efforts and encourage all Albertans to continue to contact Minister McQueen, our Premier Allison Redford and your local MLAs. We will quite soon post some sample letters that can be copied to an email or printed off and mailed to the noted parties. If a capture season goes ahead this year, the numbers being put forward is up to 30% of the estimated population of 1,000 wild horses. That would mean up to 300 beautiful wild horses being removed and with most being destined for the slaughter plants. That is so unreasonable! 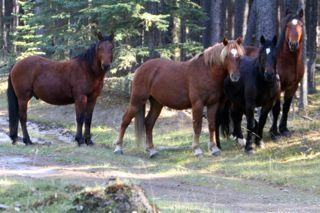 One of WHOAS’ main objectives currently is to obtain a long-term lease on land bordering or within the forestry to establish a wild horse handling and rescue facility. We are building up funds through donations and our annual calendar sales to help us reach this goal. So we do encourage you to buy one of our calendars. Besides the Millarville (Nov. 8-11) and Cochrane (Nov. 23) venues, we will be at Cremona, Dec. 7 and Olds Cow Palace, Nov. 30th to sell our calendars and to talk about your Alberta wild horses. As a rural man raised in an urban landscape, I can appreciate the beauty of the wild horses of Alberta and feel the need to engage in their protection. I rode horses until I was 16 (now 30) and wish for my own child to see the beauty of the world from horseback, and to see the wild horses for his/her own eyes (like I have). Please post the sample letters soon, so that I too can join the crusade of seeking an end to the capture season. 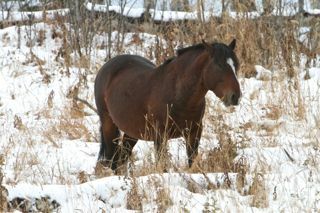 Alberta is a large enough place to have a home for the horses too. Thank you for all you have done, and continue to do!